This little guide will tell you everything you need to know about getting around the Disneyland Resort and the city of Anaheim. It's easy to get around the Disneyland resort, and you don't need to have a car to do it. In fact, you'll save money if you skip that. Most visitors fly into Los Angeles International Airport (LAX) which is about 35 miles away. Others choose Orange County's John Wayne Airport (SNA), which is about 14 miles from the Disneyland Resort. From the Disney Resort Hotels: If you're staying at the Disneyland Hotel, it's a five-minute walk to the main entrance plaza. The Monorail entrance in the middle of Downtown Disney is even closer. From the Grand Californian Hotel, you can enter directly into California Adventure through a side gate near the swimming pool. From Paradise Pier, it's 10 minutes to the entry plaza. Hotels Within Walking Distance: If you stay at a hotel within walking distance, you know what to do. Hotel desk staff can give you directions if it's not obvious which way to go. Hotels across the street from the main entrance and within two blocks of the gate are in the guide to Disneyland hotels within walking distance. Hotel Shuttles: Some hotels have their own free shuttle service. The hotel shuttles arrive at color-coded loading zones near the Disneyland entrance on Harbor Blvd. Be sure you notice your shuttle color when you get off so you can get back on the right one. Some hotel shuttles run only every few hours. If you're counting on them, call and ask questions before you make your hotel reservation. If you need a vehicle that's accessible in a wheelchair or scooter, ask about that, too. Hotels on the Trolley Route: The Anaheim Resort Transit Trolley (ART) makes it easy to get from many hotels to Disneyland. Their buses follow eight different routes, and run every 20 minutes, except mid-day during off-peak days, such as winter weekdays. The drivers do not sell tickets, but you can pay for a one-way fare with cash when boarding the bus (exact change required). You can also buy passes at some hotels or get them ahead of time online. Hotels that allow this option are in the guide to Disneyland hotels on the trolley route. All ART vehicles are ADA accessible. Driving: Driving your own vehicle gives you the most flexibility and a convenient place to stow things you don't need all day. It's also cheaper than taking the trolley if three or more adults (or children more than 10 years old) are in your vehicle. Parking at Disneyland is easy if you follow the signs and you can go in and out during the day if you need to. Just keep your parking pass to show when you come back. If you're driving from the hotel, ask at your hotel for directions and enter at any parking entrance. 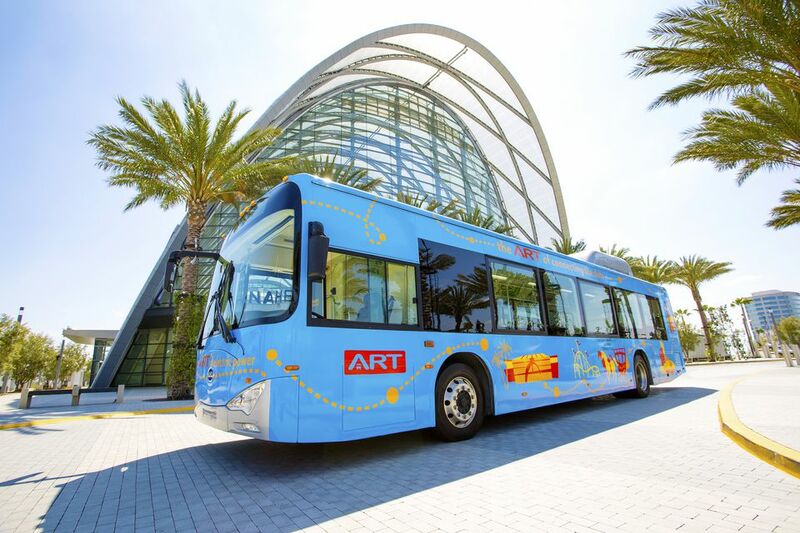 Besides running from many of the hotels to Disneyland, the Anaheim Resort Transit Trolley also goes to Knott's Berry Farm, The Block at Orange shopping area, the Convention Center, Christ Cathedral formerly named the Crystal Cathedral and other places in the area.